The EU makes us "self-absorbed and insular"
Britain is suffering a crisis of confidence in foreign policy that leaves it “sidelined in Syria, ineffective in Ukraine, unwilling in Europe, and inimical towards refugees”. These are the words of a report by some of Britain’s most senior former diplomats, intelligence officers and foreign policy academics. Authors of the damning report include the former head of British intelligence Sir Richard Dearlove, the prime minister’s former adviser on international affairs Jonathan Luff and HSBC’s chief economist Stephen King. The report claims that the crisis of confidence stems from a crisis of identity as “successive prime ministers and foreign secretaries shy away from significant foreign policy engagements”, leaving Britain “self-absorbed and insular”. The commission says: “There is a great deal of disquiet among the UK’s diplomatic community that British foreign policy lacks a clear purpose, and that as a result there is an approach to the distribution of resources that lacks strategic coherence”. This is not altogether surprising since our foreign policy is schizophrenic at best. On the one hand we seek that elusive "special relationship" with the USA, while keeping our defence policy aligned with them, meanwhile we outsource regional policy to the EU - with the rest being a grey area. There are obvious conflicts and contradictions stemming from member states respective former colonial interests. It is a wonder it functions at all. Some would point to Libya as evidence that it does not. They also said "the UK can claim to be the pre-eminent world soft power and as a result the FCO should seek a role as an agenda setter and coalition builder across a range of global challenges. But this can only happen if it is prepared to reinvent itself as an enabler of cooperation, focused on using its influence to contribute to the commons, rather than thinking in terms of narrow British interests. In a globalised world, Britain can make the case for global public goods". Readers of eureferendum.com will be nodding in vigorous agreement at this. But the truth is, while the EU retains exclusivity and legal supremacy, and authority to speak on our behalf, this simply can not happen. This is not a matter of opinion. This is an article of fact. We can only think "in terms of narrow British interests" because that's all that is permitted. If Britain does indeed want to be at the top table, playing a full and active role in world affairs then it must sit as an equal to the EU rather than a subordinate. If Britain is to "reinvent itself as an enabler of cooperation" it must have its own view and it must be free to advance that view with deference to nobody. It cannot "make the case for global public goods" without the leverage of a veto and we cannot have a coherent position if we find that the EU agenda runs counter to our own. We have finally reached the end of the road with the EU. For too long we have been riding three foreign policy horses at once, refusing to acknowledge the obvious disparities, with our heads lodged firmly in the sand. There is no way this can continue. The bottom line is that Britain has never been at ease with being in the EU and it never will be. Our foreign policy will never be fully aligned with the EUs statehood and regional ambitions - and our continued membership is irreconcilable with a global outlook. We will never be a fully committed member and it will always be a sore point that divides the nation. Moreover, even if the Leavers lose the referendum, the question is not going to go away. It has festered since 1975 and will continue to do so. In many respects the very existence of this referendum is a symptom of that. It's like an organ transplant rejection, with Cameron pumping in anti-rejection drugs, but ultimately the body will expel what is not good for it. British membership of the EU is not good for Britain and it is not good for the EU. We must start afresh. Europhiles must face up to reality and instead be pragmatic about helping us create that new template for Europe rather than trying to force a relationship that doesn't work. As much as the EU's inherent nature means we are ever more marginalised, our fundamental indecision and incoherence on EU membership is a cause of uncertainty and instability in itself - which sees our EU "partners" growing ever more impatient with us. This does not foster a culture of cooperation or trust. It makes for collective impotence, delay and self-deception. That is the weakness our enemies can and will exploit. Like it or not, our continued membership of the EU, as a matter of fact, harms our influence within Europe and in the wider world. You may not like it but leaving is the only way this question will ever be settled. Only then do we start to define a new, more cooperative relationship with the EU and once again find our place at the top tables. We cannot progress until the europhiles admit this. The europhile gambit is that a Leave defeat at the referendum will solve this issue for good. It won't. It solves nothing. It just means we continue along the same road in denial of the same old problems, with our political elites once more shunning us and telling us to go away. That can only lead to more internal strife in an already fractious UK. 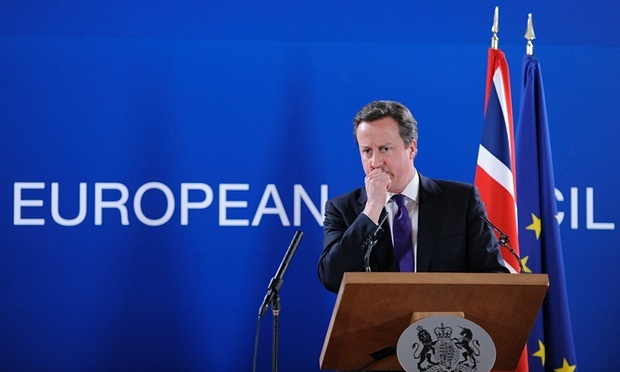 They sorely underestimate the commitment and resilience of eurosceptics. The commitment to leave the EU now spans generations. We have been here since 1975 and we are not going away. Second rate influence and supranational subjugation will never be acceptable to us no matter how many feeble concessions the PM thinks he can win. Leaving is the only realistic option and it's better we do it now than wait until it has to be done some other way. Nobody wants that.